“We are also one with the rest of God’s creation, composed of the same elements found in the rocks and rivers and trees. We participate with them in the cycle of life. Even the sun and moon are active partners in human life on God’s earth. We must not despise our ‘physicalness,’ therefore, or disregard the rest of God’s creation. We are not constitutionally superior to these things so that we can look on them with disdain” (Edward Fudge, “Part of Creation,” from The Fire That Consumes: A Biblical and Historical Study of the Doctrine of Final Punishment, Third Edition. Eugene: Cascade Books, 2011). 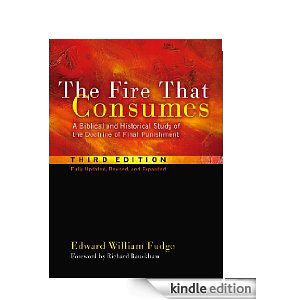 Before I get started, let me say that, though many of you may not know it, Mr. Edward Fudge (author of The Fire That Consumes) paid a visit to this blog, The Center for Theological Studies, some few days ago. I was so honored to receive a response from Mr. Fudge, and ask that you all read it in your free time. The post should be here on the main page. I wanna take time to thank Mr. Edward Fudge for paying a visit to the site and taking note of my work. It is no secret that Mr. Fudge and I disagree regarding the nature of the final punishment of the ungodly...but it is wonderful to know that he can read my work and respect my view (as I have done with regard to his view). When I first began reading The Fire That Consumes, I immediately began to wonder if annihilationism had any connection to evolution. I reasoned within that, if annihilationists believed that ungodly individuals die and “waste away,” then this meant that man is nothing more than bones, muscles, and flesh...and if this is all man is, then this idea fit the exact picture of the homo sapien detailed in Darwinian evolution. At the beginning of Fudge’s book, I was familiar with Dr. Clark H. Pinnock’s advocacy of conditional immortality. I read his chapter in the Four Views on Hell, a book that is part of the Zondervan Counterpoints Series. Fudge’s quote above, however, allows us to see a direct link between annihilationism and theistic evolution. First, note that “we are also one with the rest of God’s creation.” This idea of a “circle of life,” the theme song of The Lion King, "The Circle of Life" written by Elton John, is an evolutionary idea. “The Circle of Life” places man as a link in the chain of animal life. Man depends on the animals and the animals depend on man. Man eats animal and animal eats man. Man fears animal and animal fears man. The Circle of Life portrays man and beast as equally powerful forces bent on survival of the fittest. All of these thoughts connected with the idea show how evolutionary it is. Add to this the idea that man does not have an eternal component, that when he dies, he wastes away as does the rest of the animal kingdom! This unity mentioned in Fudge’s quote is indicative of an evolutionary stance. Next, note that “we are...composed of the same elements found in the rocks and rivers and trees.” We are in the circle of life (Fudge calls this “the cycle of life”) with the rocks and rivers and trees, and are made of the same elements as the rocks, rivers and trees. This, too, is an idea of Darwinian evolution. Evolutionists argue that we are who we are “by chance” (they disdain the notion of design). What they fail to understand in asserting this (as does Edward Fudge) is that, when they claim humans are made of the same elements as the rocks, rivers, and trees, they forget that this also means that the rocks, and rivers, and trees are made of the same elements as man (in this thought)...and that, while this may seem to knock man from his assumed “superiority of constitution,” it also elevates the rocks, rivers, and trees to human status! As I said in my last post, we ascribe human characteristics to inanimate objects through personification because we realize that these same inanimate objects do not innately possess human characteristics. A good example of this notion of Darwinian evolution can be seen in Rob Bell’s book, titled Love Wins: A Book About Heaven, Hell, and the Fate of Every Person Who Ever Lived. Bell’s chapter titled “There Are Rocks Everywhere” is the best example of theistic evolution that I know of. From 1 Corinthians 10, Bell concludes that “God is in all things” (some form of pantheism), and then labels God as “the life force” (a concept of vitalism). Let’s just say it’s the one chapter of Bell’s book that every evangelical ought to read. Now, let me say that I do agree that we are not to look down on the rest of God’s creation. Genesis tells us that everything God made was “good” and “very good,” so we are to consider it such. The birds and bees may not be human, but they are still good because God created them and called them “good.” Nevertheless, I cannot agree with Fudge when he says that we are not “constitutionally superior” to the other parts of God’s creation. I believe we are, and I believe the Scriptures teach us this. To find out where man is in the creation, let’s go to “Geneseos” (Grk. book of the beginnings, Genesis) to see if these things are so. “Then the Lord God formed man of dust from the ground, and breathed into his nostrils the breath of life; and man became a living being” (Genesis 2:7, NASB). The Lord God “tailor-made” man, and then “breathed” life into him. What other creation on earth has this happened to? I can’t think of any others. Thus, Fudge’s statement that we are not “constitutionally superior” is not true. How can it be, if man was given breath from the divine for his existence...while the animals were simply spoken into existence? God tells man to “subdue” the earth, to “rule over” the rest of the creation. What other creation is given this type of divine blessing? I can’t think of any others. “You have made him a little lower than God, and You crown him with glory and majesty! You make him to rule over the works of Your hands; You have put all things under his feet, all sheep and oxen, and also the beasts of the field, the birds of the heavens and the fish of the sea, whatever passes through the paths of the seas” (Psalm 8:5-8). God crowned the human race with glory and majesty. Genesis 1:28-30 is a good demonstration of the glory and majesty God granted to the human race at creation. If mankind has been granted the power to rule over the creation, how then can we be equal to the rocks, rivers, and trees? I simply don’t understand how there can be equality between these different portions of creation. The goal of this post was to look at the doctrine of annihilationism and see if it has any affinities with Darwinian evolution. I think it does: it values man as equal to the plants and animals, and doesn’t deem man “constitutionally superior” to these other portions of God’s creation. Yet and still, these ideas are quickly placed in trouble when one understands that man bears God’s image and likeness, unlike the rest of creation (Gen. 1:26-28); man has been granted dominion over the earth (see Gen. 1:28-30), unlike the rest of God’s creation; last but not least, man’s soul is of greater worth than the world (Luke 9:25), unlike the rest of creation. All of the above evidence testifies that man is something more than the rocks, rivers, and trees...he is not to be compared to the rocks, rivers, and trees, but to the Lord whom He is most like. God bless.